A suspected gang shooting at a Mountain View-area park left a young man wounded Friday. 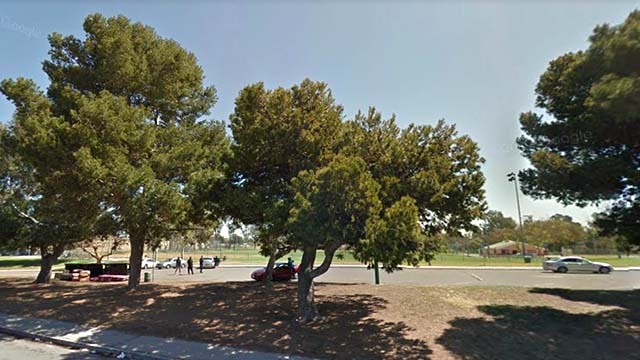 The 22-year-old victim was talking with a group of youths in a parking lot at the Willie Henderson Sports Complex on South 45th Street about 12:45 p.m. when one of them pulled a gun and shot him three times for unknown reasons, according to San Diego police. Responding patrol officers found a trail of blood, then found the victim in the 800 block of West Street, a short distance north of the city park. Medics took him to UCSD Medical Center for treatment of non-life-threatening gunshot wounds to his upper body, said Sgt. Robert Hawkins. The assailant was described as a light-skinned Latino in his late teens or early 20s with long, curly “reddish” hair, the sergeant said.